Naturally coloured diamonds are some of the rarest and most valuable gemstones found. Coloured diamonds are found the world over, with Australia's Argyle mine being considered one of the most important producers of pink diamonds. GSL provides two types of certification for coloured diamonds. Smaller stones, or Lots, can be certified as a group on a Coloured Diamond Summary, or, for the larger and more important stones, a full Coloured Diamond Report is provided. 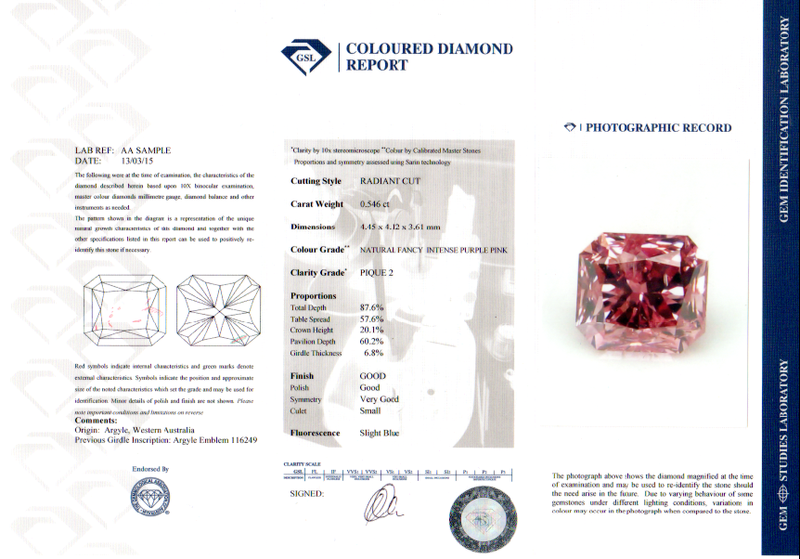 These reports list the full specifications of the stone, and in the case of Australian pink and blue diamonds GSL's advanced instrumentation and experience allows it to identify the provenance of the stone. Similarly to the white diamond certification processes, the difference between the Coloured Diamond Summary and the Coloured Diamond Report is the presence of an inclusion map and much more detailed information about the diamond on the Coloured Diamond Report. Coloured Diamond Grading Reports and Coloured Diamond Grading Summaries are also entered into the GSL Coloured Diamond Register for future reference. As in the case of white diamonds, as an added service the diamond can be laser inscribed with the laboratory report number to guarantee its identity.